boo boo ad... - A mummy's inane blabberings..
is part of a feature on fitness in Cleo Mag? Here's a contest which is being done by my colleague for doubleA..It's a shoot your own doubleA contest..
Any budding filmmakers here interested? There aren't that many entrants so the chances of winning top 3 is rather high..but the due date is 29 Oct. Check out this DoubleA ad made in Korea..solid siah.. Nursing a bad cold today..runny nose and a slight cough so I decided to stay home which explains why I'm posting right now.Will probably head back to bed soon after I pop some paracetamol..
the bike helmet's worn backwards? heh yeah..farnee hor. Wondering why the model didn't think that it was uncomfy.. I guess they did that so the helmet wouldn't block her face?! Morons. Hope you feel better soon. Hate colds. LOL..if so, that would be a truly stupid thing to do..
geez. i wouldn't have known since i've never worn a bike helmet before. eh..but it does look weird right..with the strap coming down on the sides of ur face..
not purposely hor..altho yeah..great day to stay home to lepak! Actually I thought the shoes were the wrong kind... then I realised that they might not have made such a big difference. Then I read the comments and realised that I didn't notice the helmet on backwards at all! the shoes aren't the right ones for biking im sure but that's not that much of a boo-boo unless u are a pro-cylist i guess.. U lah..always look at shoes n clothes..thats all hehe..
her helmet is on the wrong way! 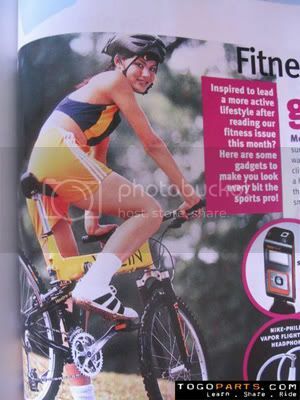 heh..i was v young then eh..abt 18 plus..it was a really big helmet too so i din realise it was on wrongly :P..